Mahatma Gandhi the legendary freedom fighter never lived to become India’s president or prime minister. Yet, sixty years later, he is still the most celebrated freedom fighter worldwide. His passive resistance philosophy still rings a bell in the ears of new generation freedom fighters. Gandhi inspired great heroes of black consciousness such as Malcolm X, Martin Luther King Jr., Nelson Mandela, Steve Biko and many more great minds such as Mwalimu Julius Nyerere among others. It was his courage in the face of imminent danger that inspired us all. He believed in nonviolence and practiced it. He feared no guns and bombs. His spirit was his greatest weapon. More importantly, he lived a humble, almost a monk’s life. For all his struggles, Martin Luther King Jr. never lived to see the true freedom and equality of the Blackman in America. He had to die prematurely for the things he truly believed in to be good and true for the human race. Though he saw the mountain top, he never lived to cross River Jordan into the Promised Land just like his predecessor the Prophet Moses of old. However, for his efforts, freedom for African- Americans was finally epitomized in Barack Obama becoming the first Black American president. One wonders how King would have felt, had he lived to see Barack Obama read his first acceptance speech to millions around the world. Like Jesse Jackson, Oprah Winfrey and millions around the world, he would have shed his small tears for Obama. Forty years after his assassination, King has become the first black man to be celebrated with a national day in American history. Coming back home to Raila Odinga situation in Kenya; his loss has angered millions of Kenyans and pleased others in equal measure. It is the nature of any contest where a winner and a looser must be produced. Since the ruling of the Supreme Court a week ago, many of Raila Odinga’s supporters I know have gone in to a depression trying to come to terms with an Odinga outside active politics. For the same reason, his perennial opponents inside and outside Luoland have gone in frenzy with celebrations that at last the mugumo tree has been felled. Raila Odinga’s fall now can only be put in perspective if one explores Luo folklore. Such great heroes like Lwanda Magere and Gor Mahia though they died physically, their spirits never died. They have lived for a thousand years after their demise. 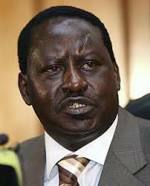 Unlike Martin Luther King Jr., Malcolm X, Mahatma Gandhi, Lwanda Magere and Gor Kogallo, Raila’s political fall is not permanent. He has a chance to rise up and pick the pieces one more time. His chance lies in assessing his situation candidly and discarding too many hangers on who might have shielded him from reality. He has to be candid with his immediate handlers and shake them off. He needs to go to Mt. Sinai like the Prophet Moses did for soul searching and commune with his God. He needs to retreat to Mt. Olives like Jesus did and commune with his Father when he knew his time was near. Both Moses and Jesus needed God’s intervention for renewed strength to face the battles before them. In real terms, Raila Odinga, for all his past sufferings, ideological sermons on reforms and just government for all Kenyans, was politically crucified the same week that Christians were remembering the Passion of Christ. In the case of Jesus of Nazareth, the Pharisees and scribes were very vocal in demanding his crucifixion to the point of urging Pilate to release Barnabas the murderer instead. And just like in Christ’s time, some of Raila’s closest friends and beneficiaries may have denied him three times or even sold him for thirty pieces of silver. Yes, there have been sadness and pleasure in equal measure on both sides of the political divide after the Supreme Court verdict. It was the same scenario after the Passion of Christ. Following the Palm Week verdict, many scribes have been quick to throw scorn on Raila and celebrate his fall, however, unlike Jesus Christ; Raila may not rise on the Third Day to rejoice with his disciples. His political resurrection may take longer. He has to develop new strategies of realizing his lifetime dream of a better, free and prosperous Kenya; a Kenya where all ethnic communities have an equal chance to be the best they can. In pursuing this dream, he may take lessons from Nelson Mandela’s endurance in prison, the Ayatollah Khomeini of Iran who became the spiritual leader of the Iranian revolution and guided the struggle until kleptocracy was defeated. The last thing that Cord followers expect is despair and disarray. Raila Odinga and Kalonzo Musyoka must go to the drawing board to find new ways of building a stronger party and give backup support to the sitting members of parliament. They must make sure that their MPs zero in on issues and put the Jubilee government on its toes to deliver on its promises. Cord must be seen in action and deed to be a credible alternative to the government in power. Time for whining and blame game should be over.